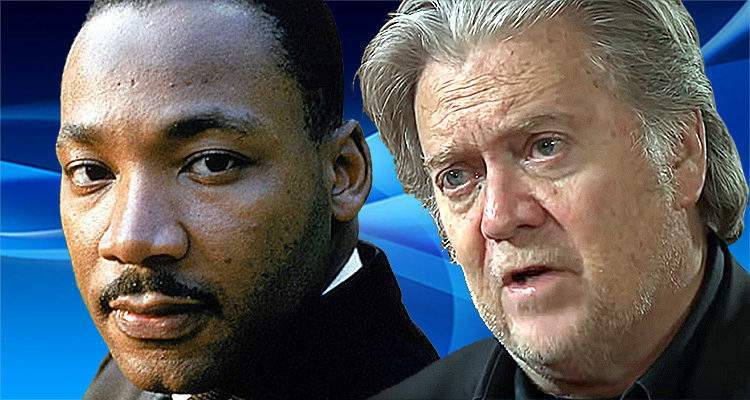 MLK’s daughter reality checks Steve Bannon for claiming that her father – Martin Luther King Jr. – would have been proud of Trump. Bernice King, youngest child of civil rights leaders Martin Luther King Jr. and Coretta Scott King, took to Twitter Thursday to dispute former White House aide Stephen K. Bannon’s claim that her father would have been proud of Trump. Bannon, Trump’s former chief strategist, made those remarks during an interview with BBC News that was aired Wednesday. “If you look at the policies of Donald Trump, anybody – Martin Luther King – would be proud of him, of what he’s done for the black and Hispanic community for jobs,” he stated. Bernice King was not buying any of it. Taking to her Twitter account, she posted a multi-part thread warning that Bannon, Trump’s former White House Chief Strategist, was “co-opting” her father’s legacy to further his nationalist agenda. “#SteveBannon has dangerously and erroneously co-opted my father’s name, work and words. Bannon’s assertion that my father, #MLK, would be proud of Donald Trump wholly ignores Daddy’s commitment to people of all races, nationalities, etc. being treated with dignity and respect.” she began.